Paul Colin : Absolute classic – 365posterblog. This is what I love about doing this blog : pick an artist and review his work, an absolute delight each day ! 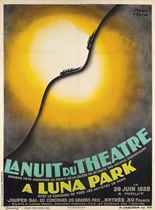 Paul Colin (27 June 1892 in Nancy, France – 18 June 1985 in Nogent-sur-Marne) was one of France’s greatest poster artists. Made famous in 1925 by his poster for the Revue Nègre, which helped to launch the career of Josephine Baker (who became his mistress), he worked for over forty years in the theatre, creating not only posters but also numerous sets and costumes. Very Art déco at the outset, (his Le Tumulte noir is a masterpiece of the genre), his style quickly became highly personal and impossible to categorize: the synthetic accuracy of his portraits, the evocative force of his posters for grand causes so marked him as a master of visual communication that his work today remains relevant and fresh. 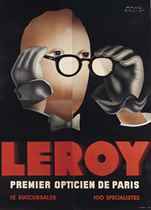 A student of Eugène Vallin and of Victor Prouvé, he is considered a master of the modern school of poster art. He is the author of over 1400 posters and many theatrical set and costume designs. Because of his vast output, Colin is another artist with a surprisingly affordable offerings with many available in the £150 bracket. Both extremely valuable (well it is Christies) We will go through some more affordable offerings tomorrow and the cover the balance of the Christies sale. Blogging posters rocks ! !